The entree ain’t as good without something on the side, ya know? Every time I hear these beautiful rap lyrics from Fabolous, I think about Rau Muống Xào Tỏi, the perfect Vietnamese side dish. 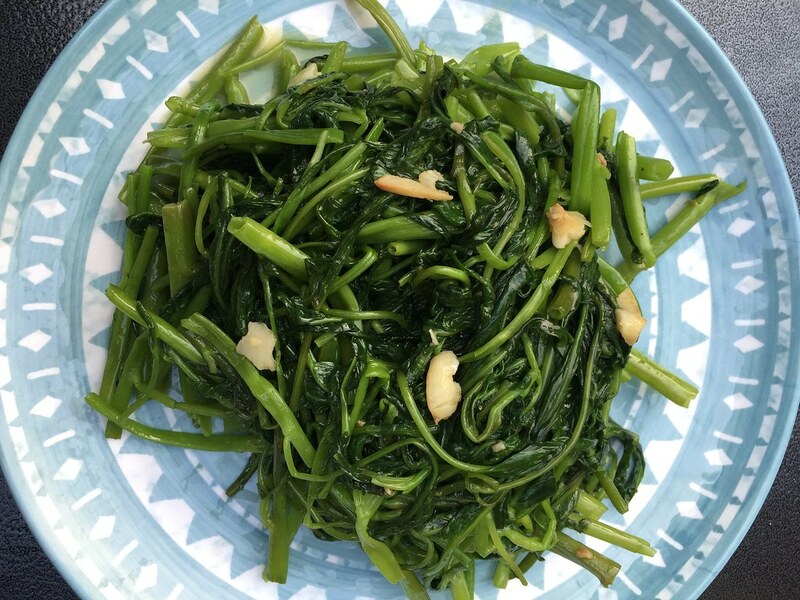 Fabolous might be talking about something else in the song, but it makes me daydream about delicious, nutritious, and tasty Rau Muống Xào Tỏi, or Stir-fried Water spinach. Most Vietnamese dishes are served family style and this dish is a great side to balance out savory braised meats and add wonderful texture to complete the family style meal. I even guarantee that non-veggie eaters in your house will fall in love with this dish. Water spinach is commonly found and cheapest during spring and summer. You can find it sold in a big bunch at Asian grocery stores. It’s super fresh and green! Unfortunately, I have not seen this at a local retail supermarket. Stir-fry Water Spinach – Heat a large skillet/wok on medium high heat until smoking. Add vegetable oil and garlic and stir fry garlic for about one minute or until smashed garlic browns. Add water spinach to skillet/wok. Toss and stir-fry water spinach for about 3-5 minutes or until water spinach becomes tender, but still has a little crunch. Remove about 1-2 inches from the bottom of the water spinach because it can be tough and hard to chew.